Read From The Bottom Tweet! 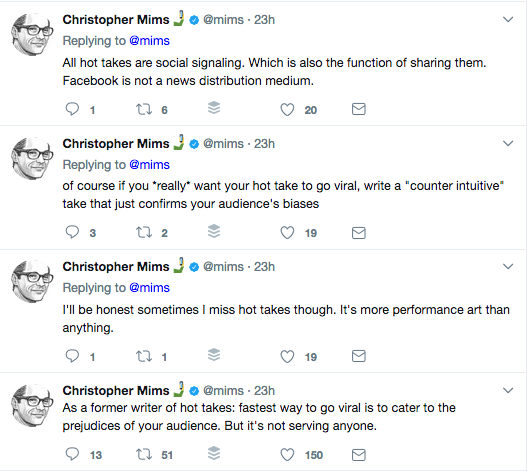 I was drawn into this little series of tweets from Chris Mims, saying that having been a creator of ‘hot takes’, he knew that the trick–or one trick at least–was to appeal to the reader’s prejudices. I can’t ignore the larger implications of what’s happening here either. We’re at a point where technology–social media in this case–is again changing the way we communicate. Specifically: there is a gap between the ability of the tech to convey a message in a way that benefits the person who sent it, and the awareness or level of sophistication of the audience to understand on a basic level what the hell they’re looking at. To be clear, the ‘people who sent it’ could be anyone from affiliate marketers to your local plumber to Russian operatives running through dozens or hundreds of Facebook accounts, staying active by swapping in farmed accounts as fast as they get banned. So yes, the level of sophistication of the people doing the advertising varies widely, but at this time all benefit from their targeted audience’s far greater collective lack of sophistication. Our collective difficulty is akin to illiteracy. It’s a basic skills challenge that’s not being handled by any sort of systematized understanding of these ad platforms, most notably (but by no means only) Facebook, native advertising platforms (Revcontent, Outbrain, AdNow, etc.) and Google properties. We’ve had new forms of advertising burst on the scene rapidly, and it’s caused the kind of confusion (and manipulation) that springs from too many people being too unaware of the grammar of a new language, in effect. It’s also made Facebook and Native advertising especially a potentially very lucrative playground for creative advertisers. In this case the medium itself, lends itself to–it almost insists on–a blurring of the line between entertainment and deception. It’s far too simplistic to say that “Fake News” is Facebook’s or the TV networks’ fault. When it comes to advertising, which funds everything let’s remember, the formats that are available to push an agenda are as potentially seductive as they are potentially deceptive. Let’s look at Mims’ ‘hot takes’. Note that Mims isn’t talking about products or political candidates at all. He is talking about attention, and how to attract it to your message in a way that scales. Because the potential to scale here–what we mean when we say “virality”–is critical to this new language. And why would the ones who’ve been on the other side be particularly interested in explaining to you how the new grammar works? Keeping the general public unaware of what they are looking at keep the gap I mentioned earlier alive, and as wide as possible. It is opportunity pure and simple–an edge. A profound one actually, that’s made a large number of people millionaires, and possibly played a big part in getting a candidate elected US President. Think about what Mims is saying. It’s not about what’s happening or what you’re selling. It’s about telling a story via an emotionally provocative angle, pure and simple. An effective hook in a time of attention diluted so profoundly that phones are as vital to dinner time as food. By the way, over time the sophistication of people reading these ‘hot takes’, viral headlines, intriguing images that defy one to click on them just to find out what in the world one is looking at, will rise. Of course there will be more means to distribute scaled deception, seductive ‘hot takes’ too. We’re seeing the start of this with software that allows us to alter video so that it looks like a person is speaking words they never said. We are already there with this tech, so my goodness imagine where we’ll be in 10 years. We will simply not be able to believe our eyes and ears when it comes to video, and see aphorisms like “don’t believe everything you read” evolve into statements like “don’t believe anything that doesn’t happen right in front of you in the physical world”? I don’t know how rational debates happen in a world where we can’t believe our eyes and ears, but I’d imagine it will feel a little like a juiced version of the skepticism people have had to employ for the last several decades when looking at or reading media reports. A healthy skepticism as always, but amplified to match the potential deceptiveness of media, or more accurately, more powerful media in the hands of those who would manipulate. This is not the end of the world, though it might feel like that for some people who cling to the media to provide some form of certainty. And isn’t that the point here? That more than ever before you’ll have to do the hard thing and THINK critically. Otherwise you will be simply a tool in the agenda of other people, marketers and most certainly people who promote politicians. It’s as pointless to wring our hands over this as it would be to blame Facebook for taking money from anyone at all who wants to run ads…well at least under the current laws. But all this naivete of course extends to our politicians, who aren’t likely quite yet anyway to really understand Facebook and native advertising, and are no doubt incentivized to look the other way anyway. It’s ironic that a growing number of them will have been helped in their election campaigns by people who certainly did understand the details of modern advertising/targeting/audience segmentation etc. works. They, the ones who need to regulate new advertising just as TV, radio, etc. has always been, are still taking advantage of this gap between the sophistication of advertisers’ messaging and the understanding of the platforms delivering those messages had by the general public.